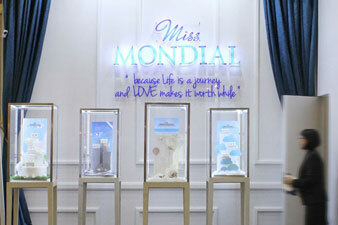 Miss Mondial booked an exhibition space in Jakarta’s largest annual wedding exhibition and this was the perfect opportunity to showcase its products. In a wedding exhibition, marketers traditionally engage in an aggressive push strategy. 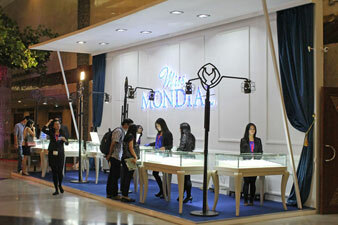 They develop extravagant looking booths and their sales promotion girls stick flyers in the face of customers. Realising that a wedding is a hectic and stressful event for brides and groom, compounded by aggressive marketing, we positioned Miss Mondial with a pull strategy: designing a booth as a sanctuary away from the madding crowd. Our booth design was simplistic but with understated glamour and a custom standing lamp was designed to match the occasion. Four show cases were designed to the stages of dating, engagement, wedding and anniversary, complete with the quote, “life is a journey, and love makes it all worthwhile” on the backdrop. Each showcase presented a theme to match the stages of a “love life”: beach theme for the pendant display, starry night theme to display engagement rings, wedding cake for wedding ring, and winter theme to display platinum rings.